How does Virtual Horse Racing work? 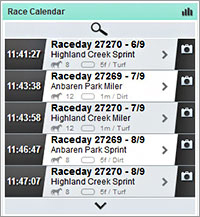 Virtual Horse Racing enables you to place bets on virtual horse races around the clock. Settlement of the bet takes place directly after the race. A race day consists of nine races that are on different surfaces (grass or sand) with different sized participant lanes (8-12 horses) and with varying distances. As a rule, two race days are always held parallel with nine races per race day respectively. It is always possible to choose between grass or sand track events. The results of virtual races are determined by an independent Random Number Generator, which cannot be manipulated and was certified in accordance with the Gambling Commission. The race day number, the race number of that day (e.g. 7/9) as well as the name of the racing track can be viewed on the video player. The race, on which the bets were placed, can be directly viewed on the video. The positions of the horses on the racecourse will be equally displayed as well as interims incl. distances and positions of the Top 6 with the colours of the Jockey shirts. In this way, users will not miss a second of the race and can continue to cheer on their favourites. The Race Calendar is the central point of navigation. Users can switch between the races here and subsequently view this on the video player. 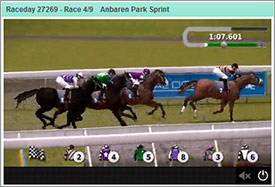 Previous races can be viewed by clicking on the upward arrow and the photo of the finish of the race can be displayed by clicking the camera icon. Clicking the magnifying glass icon will open the extensive racing archive. Various details and buttons provide all the information users may require. Statistics on horse races can also be invoked at this point. Between 8 and 12 horses can participate in a race. The progress bar indicates which phase of the game round is currently running, and subsequently imminent. A distinction is made between Start of race (70 seconds), Betting stop (10 seconds), Race (100 seconds) and End of race (10 seconds). This section enables the placement of different bets for different types of bets. Statistics on the horse about to race can be invoked for every game by clicking the “STATISTICS” icon. In addition to the name of the horse, the Jockeys shirt is also illustrated, in order to keep a closer view of the users favourite horse during the race. 1. Winner: A bet is placed on the winner of the race. 2. Lay Winner: A bet is placed on a particular horse; the user wins the bet if the horse should not win the corresponding race. 3. Place (3): A bet is placed on a horse reaching a certain place. It is assumed that the horse finishes the race in either 1st, 2nd or 3rd place. 4. Lay Place (3): In this case, the user assumes the selected horse will not finish the race in 1st, 2nd or 3rd place. 1. Straight Forecast: Users assume that the two illustrated horses will finish the race in 1st and 2nd place, exactly in this order (i.e. in this example, horse A before horse B). 2. Dual Forecast: The order of the horses bet on does not matter in this case. The essential point is that the horses finish the race in the first two places! Very high odds can be achieved here - an opportunity that should not be missed. The Triple Bet is similar to the “1st and 2nd place” type of bet. 1. 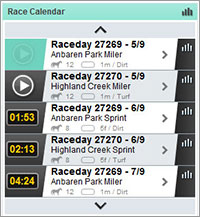 Straight Tricast: Users assume that the three illustrated horses will finish the race in 1st, 2nd and 3rd place, exactly in this order (i.e. in this example, horse A before horse B before horse C). 2. Dual Tricast: The order of the horses bet on does not matter in this case. The essential point is that the horses finish the race in the first three places! 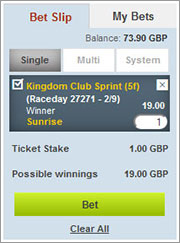 This type of bet has the highest average odds - no other individual bet can be so rewarding as this one! The betting slip works no differently to the Virtual Football League. It is possible to view the current balance of the user account and to bet the desired amount. Please note that only single bets can be placed for virtual horse racing. Unfortunately, it is not possible to place combi bets or system bets. Furthermore, by clicking “My bets”, it is possible to invoke the users bet history, look at whom the user placed bets on and check whether the user’s bet has won. The minimum stake per bet is 1.00 GBP; the maximum stake per bet is 200 GBP. The maximum winnings per bet are set at 10.000 GBP.